A plethora of jumbled thoughts. Sociologists of science have consistently identified “public recognition” as scientists’ primary motivating factor. … The nature of scientific motivation is also evident in scientific reward systems. In the culture of modern science, it is better to be wrong than to be second. To make the desire for recognition compatible aligned with prioritizing good science, we need quality metrics that are independent of sociological norms. Above all, objective quality should be based on the concept of independent replication: A finding would not be accepted as true unless it is independently verified. An estimated 720 million shells were fired during the Great War, with approximately 12 million failing to detonate. At places like Verdun, the artillery barrages were so overwhelming, 150 shells hit every square meter of the battlefield. Though the Zone Rouge started at some 460 square miles in size, cleanup efforts reduced it to around 65 square miles. With such massive amounts of explosives left in the ground, the French government estimates the current rate of removal will clear the battlefields between 300 and 900 years from now. In order to teach efficiently, experts try to cut right to the chase. They teach the Abstract Model. Why? Because, they’re trying to save you all the hassle of learning it, “The Hard Way”. The problem is, as seen by our made up model, without Concrete experiences and many of them, it’s very difficult to understand the model. Physicists can’t agree on whether the flow of future to past is real or a mental construct. What I find interesting about the “triad” concept — and what it leaves out — is that it is ostensibly focused on technologies and strategies, but it seems non-coincidentally to be primarily concerning itself with infrastructure. The triad technologies each require heavy investments in bases, in personnel, in jobs. They aren’t weapons so much as they they are organizations that maintain weapons. Which is probably why you have to defend them: they are expensive. US nuclear bomber deployments, 1945-1958. Shadings indicate blocs circa 1958. 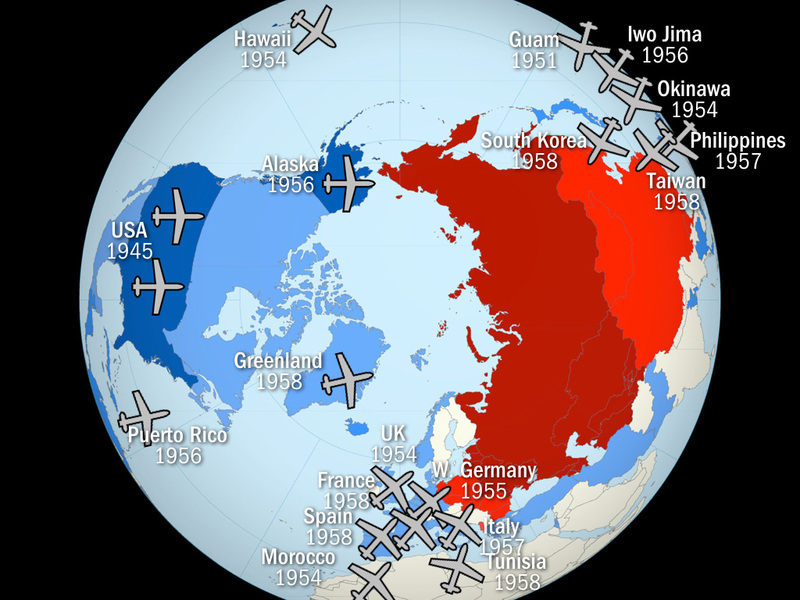 It shows what “containment” as a policy comes to mean and demonstrates the geopolitics of Cold War era bomber bases. According to one estimate, the various long-term cultural foot-dragging about ballistic missiles in the United States delayed the country from acquiring the technology for six years. Which puts Sputnik into perspective.